Explore the Blue Ridge mountains of North Carolina. Stay in a bed and breakfast and enjoy good food and scenery. Enjoy the challenges of mountain biking or relax in the support van. 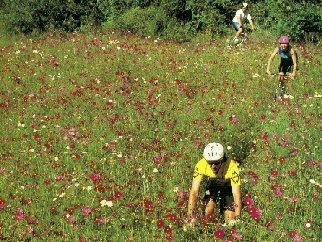 Travel picture of Riding through a bed of wildflowers. When ?, how much ?